Gift Idea: A Star on the American Walk of Fame. Honor your friend with this Hollywood star on the Walk of Fame. The stars already have one — Show your sweetheart who your star is. Bring your sweetheart a star from the sky. With this gift certificate you are always right. 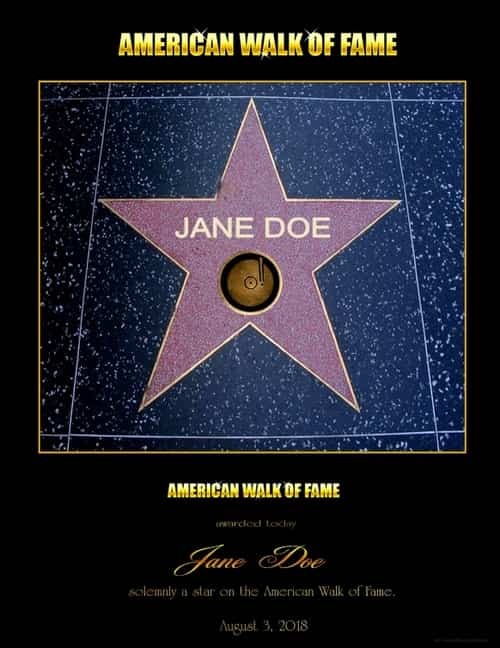 After the payment we send your Walk of Fame Certificate as pdf per E-Mail. The Hollywood Walk of Fame is an 18-block walkway in Los Angeles on either side of Hollywood Boulevard from Gower Street in the east to La Brea Avenue in the west. In addition, the Hollywood Walk of Fame continues three blocks northeast along Vine Street, starting at Sunset Boulevard in the south, crossing Hollywood Boulevard all the way up to Yucca Street. With more than 2,300 Hollywood stars to honor Bruce Willis on October 16, 2006, these street pieces honor celebrities who have or have played an important role in the entertainment industry. On a section of the Walk of Fame, some celebrities have also pressed their hand and shoe prints and their autograph into the concrete.